Staffordshire Bull Terrier owners are often after a strong-sounding name that will fit the stature of their dog. Military ranks are a common source that includes names like Colonel, General, and Captain. Other tough names come from famous people like Samson, Rocky, and Rambo. Powerful machinery provides names like Tank, Diesel, and Dozer. The breed originated in Staffordshire, England where it was popular in bull baiting (an old blood sport where dogs were tasked with immobilizing a bull). Popular English male name ideas include Bray, Eaton, and Knox. Some good female options are Piper, Storm, and Trudy. Video games have brought about many protagonists that are now sharing their names with dogs across the world. A few fan favorites include Sonic, Mario, and Link. Some of our pages will contain a subcategory. A subcategory is a slightly more specific grouping than the main topic of the page. For a subcategory, we will include a separated table of names and corresponding descriptions. An example of a subcategory of Red Dog Names would be 'Dog Names Inspired by Red Wines'. 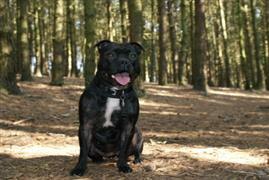 If you have any subcategory ideas for the Staffordshire Bull Terrier Names page, we would love to hear them. Use the form below to submit your ideas.